"One of the most beautiful town squares in Europe, if not in the world", is a phrase often heard when visitors in Brussels try to describe the beauty of the central market square. 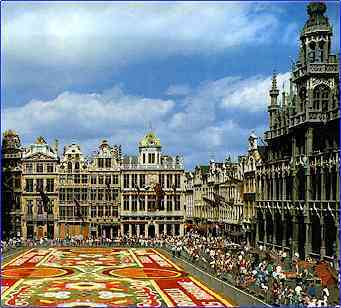 French-speakers refer to it as the 'Grand-Place', whereas in Dutch it is called 'de grote Markt'. La Grand-Place in Brussels is a remarkably homogeneous body of public and private buildings, dating mainly from the late 17th century. The architecture provides a vivid illustration of the level of social and cultural life of the period in this important political and commercial centre.